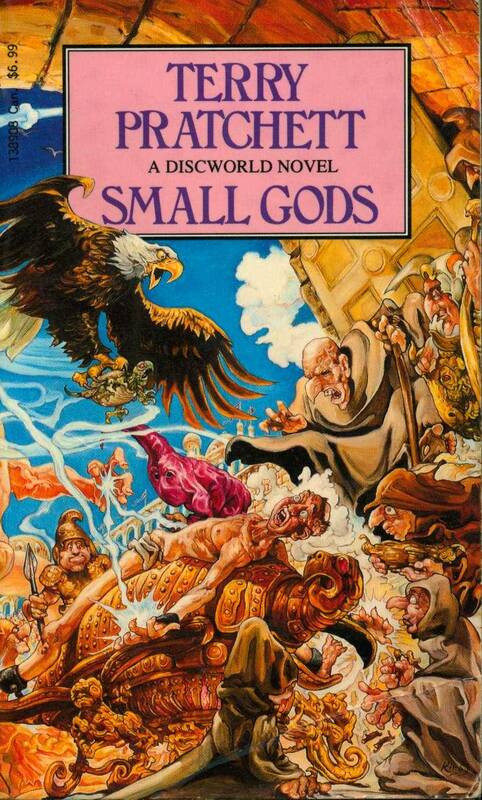 It's been far too long since my last Discworld novel, and after a string of books that I only kind of liked at best, I was hoping for something that I could be pretty certain that I would enjoy. Perhaps not the best reason to read something, but after a while you just get tired. Small Gods follows the god Om who manifested on the Disc just as his next prophet is due to be chosen, only to find that he is stuck in the body of a tortoise and has lost his divine powers. Desperately trying to regain his former powers, he finds that the only person who can hear him is Brutha, a lowly novice who seems to be destined for mediocrity at best. I was right to pick another Discworld, because this was just what I needed right now. Entertaining as always, but with a really interesting subject to satirise. Considering that Small Gods is focusing on religious institutes, a subject that can get people very angry if executed poorly or heavy-handedly, I was pleasantly surprised by how subtle this manages to be. This is despite the gods being arrogant and undeserving of praise and the clergy either being too cowed to do anything productive or sadistic enough that they're actively participating in the perversion of religious faith. This is probably down to the relationship between Om and Brutha, which is the kind of entertaining bickering that I love. On the one hand, Brutha is understandably a little doubtful that the talking turtle is his god given the distinct lack of divine power, but is quite happy to look after the little guy nevertheless. And then on the other is Om, who is endlessly frustrated by his lack of power and struggles to remember just who any of these former prophets are that Brutha keeps quoting. On top of those two, Pratchett has provided a fascinating villain in the form of Vorbis. In a way, he reminds me of Lilith from Witches Abroad. There is no doubt that what he does and what he makes other people do is evil, but because he is safe in the knowledge that he carries out his faith's doctrine, he can reason that it is all in the cause of a greater good. He is certainly not likeable, but he is intriguing to observe and in some ways incredibly pitiable.